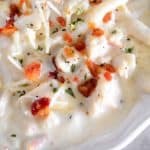 Chicken Alfredo Soup is homemade comfort in a bowl. With chicken, alfredo sauce, noodles, and bacon, this soup is perfect for a family dinner on a cold winter night. Sponsored by Reames®. The holidays are all about home and to me home means family. At this time of the year, everyone likes to make traditional family recipes full of homemade goodness from holiday dinners and to holiday desserts. When I think about home I think about love, family, religion and of course mom’s cooking. While growing up we always had family meals around a large dining room table. I remember those times being filled with delicious food, family conversations, and laughter. Although Brian and I haven’t been as successful at carrying on the tradition of nightly family meals, we do sit down as a family a few times a week for dinner. I hope my kids remember those times as fondly as I do. 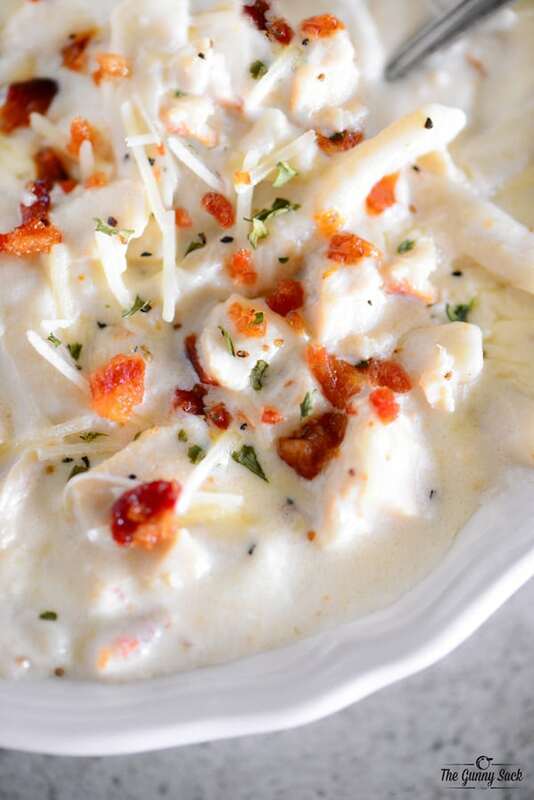 I decided to make a comforting soup that is perfect for cold winter evenings filled with some of my family’s favorites: bacon, Alfredo, pasta, and chicken. First, cook half of a pound of bacon. I like making mine in the oven because it is more hands off. 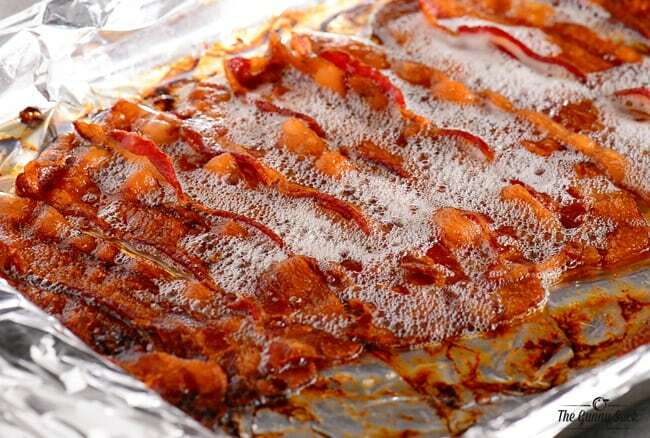 Line the strips of bacon on a rimmed baking sheet covered with foil. Bake at 375° for 15-20 minutes or until desired crispiness. Remove the bacon from the pan and place it on paper towels to cool and drain. Chop the bacon into bits once it has cool. Reserve a couple of tablespoons of the bacon grease for making the chicken and set aside a couple of tablespoons of bacon bits to garnish the soup. While the bacon is cooking bring 4 quarts of water to a boil in a large pot. Add the frozen Reames® Homestyle Egg Noodles. 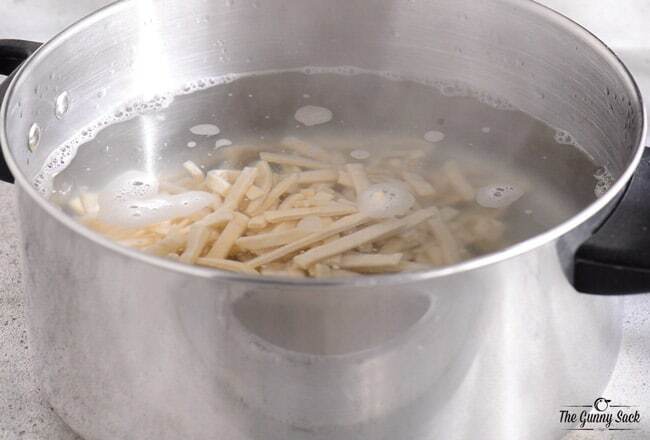 Return the water to a boil and stir to separate the noodles. Cook for 20 minutes, stirring occasionally. Drain the noodles and set them aside. Heat two tablespoons of reserved bacon grease in a skillet. Add the cubed chicken and cook for 10 minutes over medium heat, stirring often. Pour in 1/4 cup of chicken broth and continue cooking for another 5-10 minutes. Remove from heat, chop or shred the chicken into bite-sized pieces and set it aside. 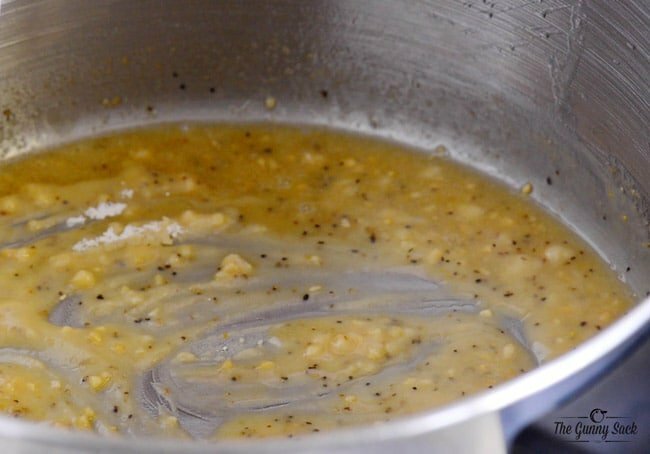 Melt the butter in a large pot with the minced garlic over medium heat. Whisk in flour and pepper. The mixture will become lumpy. Stir in chicken broth, heavy cream, and milk and whisk until smooth. Continue cooking over medium heat, stirring often, until the mixture begins to simmer. Add the parmesan cheese and cream cheese. Stir until melted. Finally, add the cooked chicken and noodles. Continue cooking the soup over low heat, stirring often, until heated through. 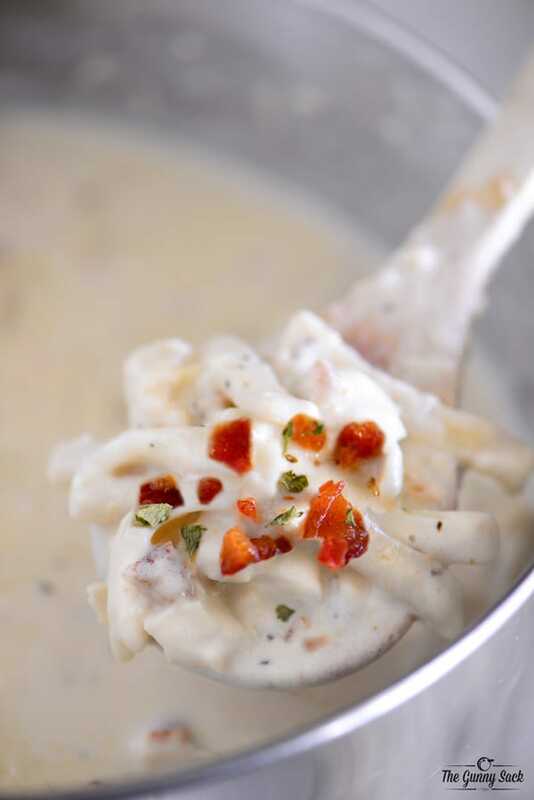 Enjoy the homemade goodness of Chicken Alfredo Soup with your family on a cold winter night. Talk about your day, share a laugh or two and make memories that will last a lifetime! Line the strips of bacon on a rimmed baking sheet covered with foil. Bake at 375° for 15-20 minutes or until desired crispiness. (Reserve a couple of tablespoons of the bacon grease.) Place cooked bacon on paper towel to cool and drain. Once cooled, chop into bits and set aside a couple of tablespoons for garnish. While the bacon is cooking, bring 4 quarts of water to a boil in a large pot. Add the frozen noodles. Return to a boil and stir to separate the noodles. Cook for 20 minutes, stirring occasionally. Drain the noodles and set them aside. Heat two tablespoons of reserved bacon grease in a skillet over medium heat. Add the cubed chicken and cook for 10 minutes, stirring often. Pour in 1/4 cup of chicken broth and continue cooking for another 5-10 minutes. 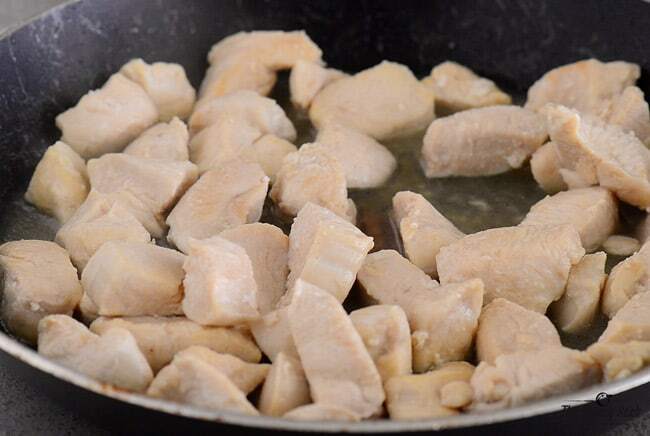 Remove from heat and chop or shred the chicken into bite-sized pieces. Melt butter in a large pot with minced garlic, over medium heat. Whisk in flour and pepper. Mixture will become lumpy. Stir in remaining chicken broth, heavy cream, and milk until smooth. Continue cooking over medium heat, stirring often, until the mixture begins to simmer. Salmon and shells! My grandma used to make it all the time growing up! Spaghetti is my favorite food of all times. My dad’a Spanish rice! The recipe is never the same measurements (dad just throws ingredients in until it tastes just right) but always tastes amazing! My moms fried chicken, biscuits & gravy!!! Perogies. They remind me of my childhood. My dads chili! Every time I even smell it it brings back memories. I love making my grandma’s lasagna and everyone always love it. Chocolate Bread is one of my favorites. I like 2 make cheesey scalloped potatoes or broccoli & cheese & rice casserole. Lasagna! I always loved when my mom would make it growing up and when I have a good lasagna now it reminds me of home! My Mama’s recipe of Stew Beef and Potatoes. So glad she taught me how to make it. It’s my comfort food for sure. MY RECIPE THAT BRINGS ME HOME IS CHICKEN AND DUMPLINGS. My mom’s meatloaf recipe takes me home! for me, it’s pork chops with applesauce and mashed potatoes. Homemade cinnamon rolls because my grandmother always had a pan of them made for every big family dinner. They were so good! I make a chicken and biscuits dish that is so satisfying and comforting! I love making it. 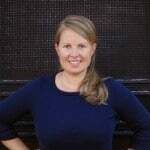 My favorite recipe that brings me “home” is Mom’s spaghetti and meatballs. Her secret sauce always started out with a fried pork chop! Spaghetti is the recipe that brings me home. Yum! Homemade gumbo always brings me home. I grew up in the south on REAL cajun food. Now living in the north, I look forward to it every single trip home. I love my Mom’s macaroni and cheese! Fried Chicken! It’s my most comforting and most requested. I use boneless thighs marinated in a mix of eggs, milk and Frank’s Red Hot. Then I drain and dredge in a mix of flour, ranch dip mix, salt and a ton of black pepper. Thanks for the great giveaway! My BLT salad makes me and my family at home: 110 oz. ala dente mini Farfalle pasta, 4 cups mayonnaise, 2.5 cups sour cream, 6 oz. peas, 9 oz. chopped celery, 11.5 oz. real bacon bits, 22 oz. chopped tomato (roma), 12.5 oz. lettuce. Mix until consistent. serve over medium crusted toast, or crackers. If you want a kick, add a jalapeno on top of each sandwich. The recipe that brings me ‘home’ is my mother homemade Lasagna! The recipe that brings me ‘home’ is my Mom’s pork chop and spaghetti. I love the sauce especially, and the flavor. It’s basically pork chops cooked in homemade sauce. Very flavorful! The recipe that brings me home is meat loaf. In my meat loaf we use the typical stuff like hamburger, bell pepper, ketchup, bread crumbs and onion. What makes my meat loaf different is that I put hard boiled eggs in the middle of it. It taste great and you use less meat this way. It is a family favorite at our house. We also top our meat loaf with ketchup..no fancy sauce to make.